ATTACKED CHRISTIAN MISSIONS IN LAST NIGHT'S LECTURE. INJURY BY PREACHING OF A CRUCIFIED CHRIST. Swami Vive Kananda lectured to a very large audience at the Detroit Opera House last night on "Christian Missions in India.". One could believe that the lecture was intended as an answer to the many statements of missionaries which have been aimed at Kananda during the past two weeks in this city. Kananda was introduced by Honorable Thomas W. Palmer last night, who recited a fable by way of preface. "Two knights of honor once met on the field," he said, "and seeing a shield hanging on a tree they halted. One said: 'What a very fine silver shield.' The other replied that it was not silver but copper. Each disputed the other's statement until at last they got off their horses, tied them to the tree, and drawing their swords fought for several hours. After they were both well spent by the loss of blood they staggered against each other and fell on the opposite sides from where they had been fighting. Then one glanced up at the pendant shield and said: 'You were right, my friend. The shield is copper.' The other looked up and said: 'It is I who was mistaken. The shield is silver.' If they had looked at both sides of the shield in the first place it would have saved the loss of much blood. I think that if we looked at both sides of every question there would be less argument and fighting. "We have with us tonight a gentleman who, from the christian standpoint is, I suppose, a pagan. But he belongs to a religion which was old long before ours was thought of by men. I am sure that it will be pleasant to hear from the copper side of the shield. We have looked at it only from the silver side. Ladies and Gentlemen, Swami Vive Kananda." Kananda, who had remained seated on the stage during Mr. Palmer's remarks, stepped to the front, clad in the orange robe and unique turban of the Brahman [sic] priest, bowed in acknowledgement of the welcoming applause, and launched at once into his subject. I do not know about the efforts of christian missionaries in China and Japan except through reading the books and literature on the subject, but I can speak about the efforts of christianizing India. But before I go into this I want to place before you an idea of what India is. Then he explained in detail how the 300,000,000 inhabitants of India are divided into castes, between which there can be no affiliation, how the natives of the south cannot understand the language of the ones of the north, and vice versa. He told how the lower caste lived on the flesh of dead animals, and never bathed their bodies, and how impossible it would be for the higher class to mingle with them, although they were granted the protection of the same laws. Every religion has its miracles; you needn't laugh because the tooth was a foot long. Well, after the Spaniards took away the tooth they converted a few hundred and killed a few thousands; and there Spain stops in the history of missionary efforts among the Buddhists. The Portugese [sic] christians, he said, discovered the great temple at Bombay, built in the form of a body with three heads, in representation of the trinity as the Hindoo believes in a trinity. and so they concluded that it was of the devil, and gathered their forces and knocked off the three heads of the temple. The devil is such a handy man. I am sorry to see him so fast disappearing. The Hindoo priest told how as soon as the land came into possession of the English people every village had its white colony, which huddled itself together and withdrew from all association with the natives. Then when the missionaries reached the country, he said, they would naturally go at once among the English people, who sympathized with them and with whom they could converse. The missionaries know nothing of the native language, he says, and so they cannot dwell with the people. Most of them are married and for the sake of getting their wives into the English society they identify themselves with all their interests, and in doing so directly antagonize the interests of the natives, and make it impossible to get in touch with them. "We sometimes have famines in India," he said. And so the young missionaries will hang about the fag end of a famine and give a starving native 5 shillings, and there you have him, a ready-made christian; take him. That was probably a baptist missionary, and so when a methodist missionary comes along he gives the same native 5 shillings, and his name is again registered as a convert. The only band of converts around each missionary is composed of those dependent upon him for a living. They have to be christians or starve. And they are dwindling as the money supply decreases. I am glad if you want to make christians in India by giving work and bread to the poor. God speed you to do that. There is one benefit that must be credited to the missionary movement. It makes education cheap. The missionaries bring some money with them from the people who send them, and the Indian government appropriates some, so that there are some very good colleges and schools available to the natives through missionaries. But I will be frank with you. There are no conversions from the schools to the christian religion. The Hindoo boy is very clever. He takes the bait, but never gets the hook. The speaker said that the lady missionary goes into certain houses, gets four shillings a month, reads the Bible, while the native girls give indifferent attention, and teaches them to knit while they pay very keen attention. The girls, like the boys, he said are always alert to learn practical things, but they will give little heed to the christian religion, although they will espouse it if necessary to get the other advantages. "The most of the men whom you send us as missionaries are incompetent," he said. I have never known of a single man who has studied Sanscrit [sic] before going to India as a missionary and yet all our books and literature are printed in it. He suggested as an explanation of the visits of the missionaries that "perhaps the atheism and scepticism at home is pushing the missionaries out all over the world." 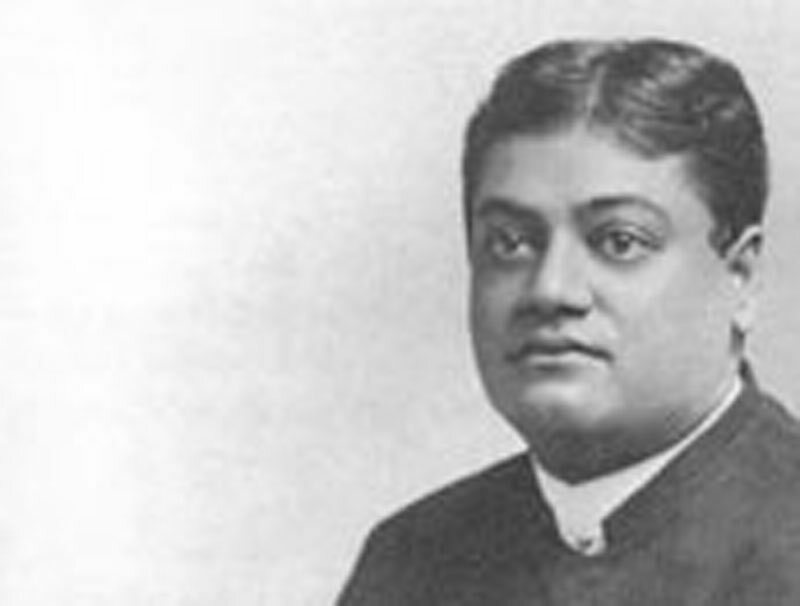 When in India he said he had thought the sole business of christianity [was] to send all people to the fires of hell, but since coming to America he has found that there are a great many liberal men. He referred to the parliament of religions, and told how a certain editor of a presbyterian paper had written an article at the close of the parliament entitled "The Lying Hindoo," in which he had scored him very severely. In the article the editor said that "while in the parliament he was here as our guest, but now that it is over we ought to make an enthusiastic attack against him and his false doctrines." India requires health, but it must be health for people. And how can you help our people if you do not get in touch with them? When you come to us as missionaries you ought to throw over all idea of nationality. Jesus didn't go about among the English officials attending champagne suppers. He didn't care to have his wife get into high European society. If your missionary does not follow Christ what right has he to call himself a christian? We want missionaries of Christ. Let such come to India by the hundreds and thousands. Bring Christ's life to us and let it permeate the very core of society. Let Him be preached in every village and corner of India. But don't have your missionaries choose their profession as a means of livelihood. Let them have the call of Christ. Let them feel within that they were born for that work. As far as converting India to christianity is concerned, there is no hope. If it were possible it ought not to be done. It would be dangerous; it would mark the destruction of all religions. If the whole universe should come to have the same temperament, physical or mental, destruction would immediately result. Why couldn't you convert the Jew? Why couldn't you make the Persians christians? Why is it that to every African who becomes a christian 100 become followers of Mohammed? Why can't you make an impression on India and China, and Japan? Because oneness of mental temperament all over the world would be death. Nature is too wise to allow such things. The christian nations have filled the world with bloodshed and tyranny. It is their day now. You kill and murder and bring drunkenness and disease in our country, and then add insult to injury by preaching Christ and Him crucified. What christian voice goes through the land protesting against such horrors? I have never heard any. You drink the idea in your mothers' milk that you are angels and we are devils. It is not enough that there be sunlight; you must have the eyes to see it. It is not only necessary that there be goodness in people; you must have the appreciation of goodness within yourselves in order to distinguish it. This is in every heart until it has been murdered by superstition and hideous blasphemy. Then Kananda drew a very beautiful simile to illustrate that the essential truths of all religions are [the] same, and all else is but incidental and unimportant environment. He told how the savage man might find a few jewels, and prizing them, tie them with a rude thong and string them about his neck. As he became slightly civilized he would perhaps exchange the thong for a string. Becoming still more enlightened he would fasten his jewels with a silken cord; and when possessed of a high civilization he would make an elaborate gold setting for his treasures. But throughout all the changes in settings the jewels — the essentials —would remain the same. If the Hindoo wishes to criticize the christian religion he talks of the fables and miracles, and all the nonsense of the Bible, but he does not say one word in disparagement of the sermon on the mount, or of the beautiful life of Jesus. And so when the christian criticizes the Hindoo religion he talks about the dogmas and the temples, but he says nothing [should say nothing] against the morality and philosophy of the Hindoo. Help the Jew and let him help you. Help the Hindoo and let him help you. I deny that any human being has the faculty of seeing good at all who cannot see it in all places. There is the same beauty in the character of Christ and the character of Buddah. It is not an assimilation that we want, but adjustment and harmony. I ask the preachers to give up, first, the idea of nationality; and second, the idea of sects. God's children have no sects. Much has been said about the ladies of India, and of their faults and condition. There are faults; God help us to make them right. We are thankful for your criticism of our women. But while you are speaking of them I will say that I should be glad to see a dozen spiritual women in America. Nice dress, wealth, brilliant society, operas, novels — . Even intellectuality is not all that there is for a man or woman. There should be also spirituality, but that side is entirely absent from christian countries. They live in India. Vive Kananda's large audience listened very respectfully to his remarks last night, and once or twice applauded heartily.